The SARRAH Board and National Office welcomes the appointment of Catherine Maloney to the position of SARRAH Acting CEO. SARRAH president Rob Curry attended the first meeting for 2019 of the Australian Allied Health Leadership Forum (AAHLF) on Friday 28 March 2019 in Canberra. SARRAH Deputy CEO Deslie Rosevear attended the 3rd Victorian Allied Health Research Conference on Friday the 22 March to present SARRAH memberships to the winners in 2 categories. SARRAH is delighted to have be asked to provide and present 2 full individual memberships as prizes for the "Best Rural Health Oral Health Presentation" and the " Best Rural Health ePoster Presentation" at the 3rd Victorian Allied Health Research Conference. View the Frdiay 22 March issue. This report identifies trends and differences in alcohol and other drug use, harms and treatment in Major cities and Regional and remote Australia. View the Friday 15 March issue. We ask you all to take a minute to think of all the wonderful women who have played an important part in your life. Balance drives a better world. Let's all help create a #BalanceforBetter. View the Friday 8 March issue. I regretfully advise that the SARRAH CEO, Jeff House has resigned his position effective from Friday 15th February 2019. View the Monday 18 February issue. ISSUE 27: Friday 8 February 2019 - Helping behaviourally challenged students to do well with Dr Ross Greene, member profile and more. Dr Ross Greene is an internally recognised child psychologist and acclaimed author. He is coming to the Port Lincoln Hotel, South Australia to deliver a workshop on the 29th June as part of his 2019 National Tour. View the Friday 8 February issue. Congratulations to SARRAH mebers Ed Johnson, who won Speech Pathologist of the Year and Jill Crookes, finalist for Psychologist of the Year at the inaugural Australian Allied Health Awards. View the Friday 1 February issue. 2019 has kicked off to an exciting start as the SARRAH team is honoured to welcome two new Directors to our Bopard, Julie Hulcombe and Lauren Gale. View the Friday 25 January issue. 2018 has been a busy year and a year of change as we rebuild and renew in the aftermath of the loss of federal funding. Our main priorities have been to improve our financial position and restore a solid base of reliable, ongoing revenue. We also completed a comprehensive review of every aspect of the organisation and at our planning summit in April and through the leadership of the board, laid out a bold new agenda of renewal, building on the solid foundation of SARRAH’s 23 year history. Read the Wednesday 19 December issue. View the Friday 7 December issue. ISSUE 22: Friday 30 November 2018 - Visit to South Australia, Public Health Success and Meet a Member! In this issue, SARRAH's Terence meets with stakeholders in South Australia and talks allied health rural generalist pathway, we profile one of our SARRAH members and we celebrate the top 10 public health successes over the last 20 years. View the Friday 30 November 2018. Scholarships of up to $18,000 are available to support students from regional ad remote Australia to study science, technology, engineering and mathematics (STEM) cources, including health and agriculture. View the Friday 23 November issue. The University of Newcastle, Department of Rural Health and the Department of Medical Imaging & Radiation Sciences at Monash University are considering a fully online "Graduate Certificate in X-Ray Image Intepretation" targeting rural health professionals from a range of disciplines. View the Friday 16 November issue. 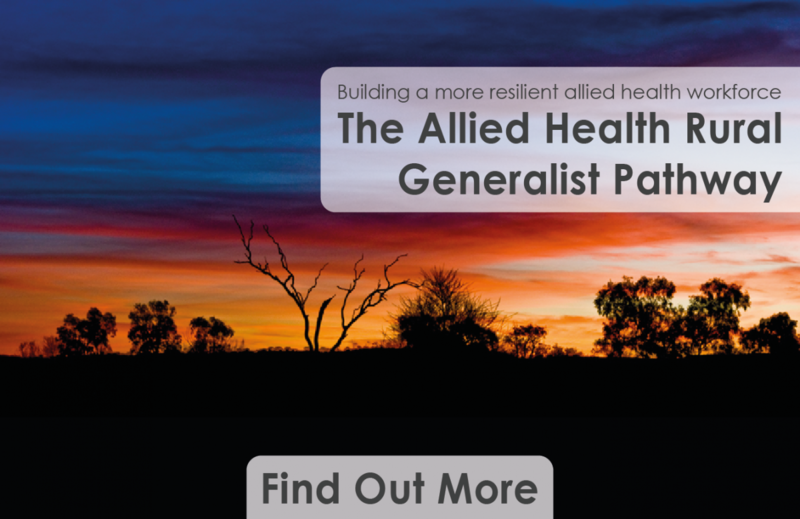 The Allied Health Professions Office of Queensland will showcase the work and outcomes from the implementation of the Allied Health Rural Generalist Pathway across 11 rural and remote teams in Queensland Health. View the Friday 9 November issue. The SARRAH Team is honoured to welcome Louise Bilato, Kim Bulkeley and Matt Thomas to join our Board of Directors. The SARRAH Special General Meeting (SGM) will take place on 21 November via teleconference where members are asked to accept the 2017-18 audited financial statements. View the Friday 2 November issue. SARRAH recently requested a dataset from the Australian Bureau of Statistics that has been build out of the 2016 Census. The dataset covers all the allied health professions that SARRAH represents. Whilst work is underway to translate this data, this week we are starting our workforce snapshots. View the Friday 26 October issue. Addressing the rural and remote healthcare gap means that a single solution may not make a significant impact. To address this complex issue, SARRAH is currently developing a roadmap to better rural health outcomes which has seven solutions that can work together to improve the health of people living in the bush. View the Friday 19 October issue. SARRAH believes in working closely with our industry partners to achieve our mission, so Australian and rural and remote communities have allied health services that support equitable and sustainable health and well-being. View the Friday 12 October issue. SARRAH is currently developing a report for the NSW Ministry of Health on what factors influence the recruitment and retnetion of allied health professionals in rural and remote communities. View the Friday 5 October issue. The Squawk Awards for 2018 were presented at the 2018 SARRAH National Conference in Darwin earlier this month to Robyn Glynn, and to Cathy Maloney. View the Friday 27 September issue. This year's conference them, 'Changing Landscapes, Changing Lives' showcases and explores changes in, including but not limited to, workforce, training and professional development, service delivery models, clinical practices and service delivery, community engagement, cross cultural service provision and Aboriginal health. View the Friday 7 September issue. SARRAH President Rob Curry attended the Rural Health Minister’s Roundtable discussions in Canberra. Sadly the Minister, Bridget McKenzie, was unable to attend the meeting due the momentous political events of that day, so the meeting was chaired by Professor Paul Worley, the National Rural Health Commissioner. View the Friday 31 August issue. Under the Stronger Rural Health Strategy, the Workforce Incentive Program (WIP) will provide targeted financial incentives to encourage medical practitioners to deliver eligible primary health care services in regional, rural and remote areas that have difficulty attracting and retaining medical practitioners. View the Friday 24 August issue. The SARRAH National Office met with representatives of the New South Wales and Victorian Governments to discuss the value of the Allied Health Generalist Pathway in addressing workfroce and service delivery challenges, specifically with respect to recruitment and retention of allied health professionals. View the Friday 17 August issue. SARRAH's Board of Directors will work alongside the SARRAH National Office and other key stakeholders to help achieve SARRAH’s vision, to be the recognised peak body representing and influencing reform in rural and remote allied health, with a supported and dynamic member network. View the Friday 10 August issue. SARRAH believes it is vital to celebrate the role of our allied health professionals in keeping Australians healthy and happy when being active and playing sports. View the Friday 3 August issue. SARRAH has now implemented a Member Action Plan which aims to effectively prioritise actions and ideas of members presented during the biennial SARRAH Conference. View the Friday 27 July issue. ISSUE 5: Friday 20 July 2018 - Outreach in the Outback, Conference, Awards and more! Fiona Brooke, SARRAH's Director of Policy and Evidence spoke at the Indigenous and Remote Health Conference in Brisbane and participated in a panel discussion on exploring the potential of mixing public, private and community funding in Indigenous healthcare. View the Friday 20 July issue. ISSUE 4: Friday 13 July 2018 - Take advantage of the early bird and secure your spot at the 2018 SARRAH National Conference! Our early bird registrations will be closing next week so be sure to register before 25 July 2018. Our members are offered a further discount, so join up as a SARRAH member, book your conference ticket, and share this message with your fellow colleagues, and students. View the Friday 13 July issue. ISSUE 3: Friday 6 July 2018 - Awarding Industry Excellence, Senate Inquiry on Obesity and more! Nominations for the SARRAH Squawk Award is now open and SARRAH is calling for member nominations. The award recipient will be announced at the Conference Dinner in Darwin. View the Friday 6 July issue. ISSUE 2: Friday 29 June 2018 - Proving our worth, SARRAH Conference, and more! SARRAH brought together researchers, corporate members, Aboriginal and Torres Strait Islander members and health policy experts to discuss why allied health is undervalued in the health system. View the Friday 29 June issue. SARRAH is excited to announce the full 2018 SARRAH National Conference program which was released during the weke by the Conference Organising Committee. The Conference will be held at the Darwin Convention Centre, Northern Terriroty on 12 - 14 September 2018. View the Friday 22 June issue.